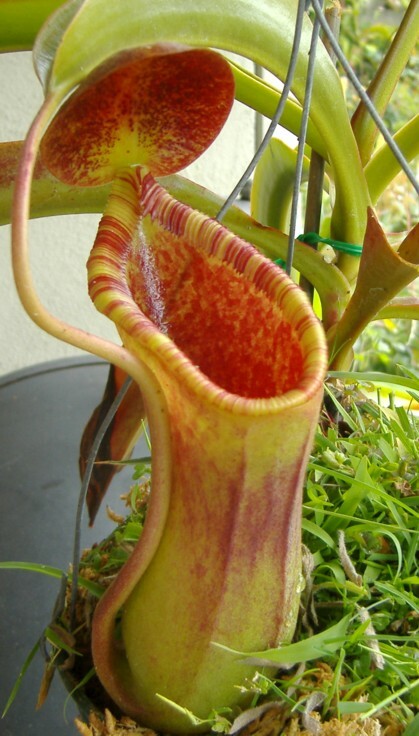 N. lowii X burkei "clone 1"
Nepenthes lowii X burkei is hybrid between two highlanders. I purchased two different cuttings of the same cross from a private grower. He called one of the crosses the slow grower and the tags were different. One was N. lowii x burkei and the other was N. burkei x lowii. My guess is that the real N. burkei wasn't used in the cross so it could be that this is really just N. lowii X ventricosa or the reverse N. ventricosa X lowii. The combination of N. lowii and N. ventricosa make for a fantastic hybrid. Definitely one of the classics. 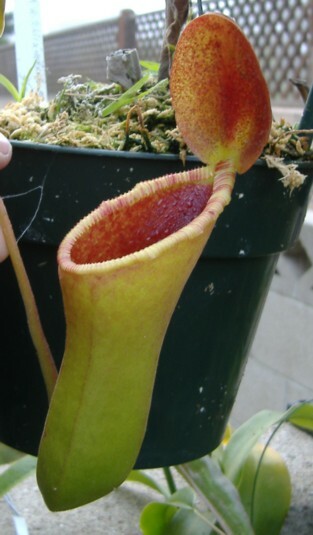 Other versions I grow of N. ventricosa x lowii include N. X briggsiana 'Peter D'Amato' and 'Jeff Shafer' (that's what I call it, not a registered cultivar name). Also, Exotica Plants did the reverse, N. lowii x ventricosa. Exotica Plants offers rooted cuttings of what they call "select" meaning that they are cuttings from their select plants. This hybrid grows great in typical highland conditions for me outdoors. It's a little slow growing starting out, but once it gets into the vining stage it goes much faster. Also, it seems to readily put out basal shoots making for multiple growth points. These plants will be in high demand for some time to come and command collector's plant prices unfortunately. Fortunately however, rooted cuttings do appear from time to time so availability isn't impossible. Cultivation: easy outdoors; moderate to quick grower for a highlander; possible as an indoor hanging plant?